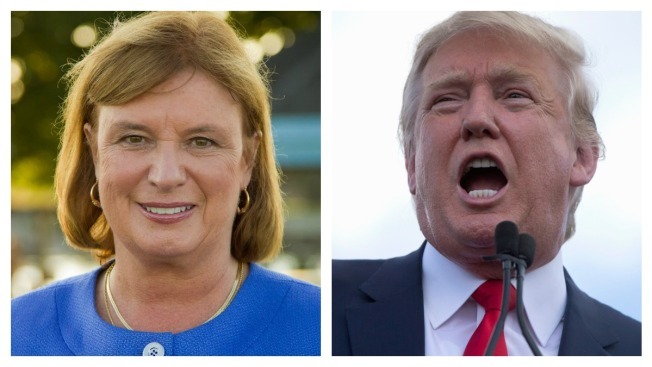 Carol Shea-Porter and Donald Trump. New Hampshire Congresswoman Carol Shea-Porter has joined a growing number of Democrats who say they don't plan to attend Donald Trump's inauguration. Shea-Porter said in a tweet Monday night that instead of attending Friday's ceremonies, she'll go to religious services to "pray for all of our leaders and people.'" More than 40 House Democrats have declared they will not attend the event. Many have cited the feud between the Republican president-elect and Democratic Georgia Congressman and civil rights leader John Lewis. The rest of New Hampshire's Congressional delegation, all Democrats, haven't said they will skip Friday's ceremony. Congresswoman Annie Kuster said she the day after, she plans to attend the Women's March on Washington, which was organized as a protest to many of Trump's policies and statements.